We have also seen VCAP6-DCV Design Objective 1.1, VCAP6-DCV Design Objective 1.2 and VCAP6-DCV Design Objective 1.3 in which we discussed about Business and Application Requirements,Risks,Constraints, Assumptions and also discussed how to map the business requirements into VMware vSphere Logical Design and also talked about mapping service dependinces here are the links for your reference in case you missed it VCAP6-DCV Design Objective 1.1, VCAP6-DCV Design Objective 1.2 , VCAP6-DCV Design Objective 1.3 , VCAP6-DCV Design Objective 2.1, VCAP6-DCV Design Objective 2.2. In our recent post VCAP6-DCV Design Objective 2.3 related to this VCAP6-DCV Design series we also talked about how we can build the availability requirements into a vSphere logical design. Another good week came to an end was involved with another VMware vSphere 6 Design and Deploy class lot of interesting questions to answer and lot of new vSphere Design examples to share. Well if in case i missed it earlier and you guys already not aware about the Design exam simulator available at vmware.com/education here is the link for your reference Practice Exam which will give you a brief about how the VCAP6-DCV Design exam looks like. Time to begin with VCAP6-DCV Design Objective 2.4 which will help us to proceed further with our ultimate goal VCAP6-DCV Design exam, will be focussing on the management services to be included in the design. When working towards design decisions towards management solution to be included in the design will start with update manager as it is one of the key aspect to be consider when thinking about infrastructure manageability and the design decision follows with the deployment model to be used for update manager ? Depending upon the environment we can go with All in one wherein the update manager will share the database with vCenter Server and vSphere update manager will be installed on the vCenter Server host machine, another option available for us is to choose the medium deployment model where we can go with a separate database instance for vSphere update manager however installing the vSphere update manager on vCenter Server host and the last option is large deployment model installing vSphere update manager on separate host and choosing a separate database instance for update manager. Which baselines should be used static/dynamic? 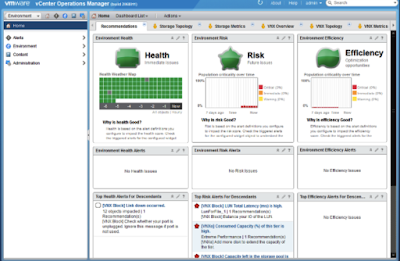 How should ESXi and vCenter Server settings should be configured? vSphere update manager deals with patching / update / bug fixes of ESXi, Appliance, VMware tools, VM's Hardware version means we still have to find another way to update guest os and applications which should also be included in design decisions pertaining towards infrastructure manageability. Either we can go with existing tools and method the customer is using as it requires less training to resources, moreover the tools they are currently familiar with may require little modification to work in a Virtual Environment. Another option which can be used is to make use of VMware vRealize Configuration manager which can help us automating the operating system and software provisioning and patching. Few more important design decisions to take care of when working towards infrastructure manageability requirements and fitting them to our logical design. What management tools should be used for troubleshooting and performance monitoring, and day to day operations this question helps us define the scope of various other tools which can make our life easier when it comes to troubleshooting we can make use of (vRealize Log insight) as it provides us a better insight to logs and for monitoring we can use alarms, performance charts and command line management tools or we can also go with (vRealize operations manager) for day to day operations we use vSphere Web client and if in case the business requires for automating the day to day operations we can include vSphere Management Assistant and vSphere Power CLI. How we would be working towards the template and snapshot management are two another important factors to be considered, whether content library should be used for the ease of template management or not and as far as snapshots are concerned we cannot consider them as backup however we can ensure they are included as part of the change management process and might requires management approval. ESXi installation would be taken care through native installation method or the entire process should be automated scripted automated installation definitely reduces the overall time of deployment and also avoid configurations errors however whether it should be included in the design in the first place is a question depending upon the size of the environment we are dealing with and how comfortable the business is when it comes to scripted installation. Design decisions should also be taken care related to CIM and SNMP ensuring a proper SNMP trap destination is configured which can affect the information being sent to wrong destination. Database retention policies is another important design decision to be included as they help us to decide when to delete the vCenter Server related tasks and events, make sure you have a proper business justification of going with longer retention period as it provides a better scope of troubleshooting however also needs a bigger database. Key Note : As part of this objective when working closely towards achieving the design goal it's not only the management tools/Installation related design decision that we need to take care.